High school can be brutal. At least you’ve got a set of bocce balls to keep the ghouls at bay. Feeling like you’ve seen everything zombie-themed games have to offer? Think again! You’re already infected… how will you spend your final minutes? Student Bodies delivers a mad dash to find an antidote for the poison slowly killing you… and a bunch of vicious fellow players who would throw you to the horde to save their own skin! The Student Bodies board is long and narrow – it will take up most of the center of the table, but leaves lots of room on either side for 4 players. Once placed, you will arrange the lab doors and fire doors on their designated spots to separate the board’s three sections (lab/hallway/exit), place four zombies to the side in the lab, four to the side at the exit and ten to the side of the main hallway. While the board is static, set-up is not. Each of the board’s 3 sections has a deck of corresponding set-up cards. You must shuffle each of these decks and draw the top card (top two cards for the hallway) to determine how that section will be set up. The hallway is arranged immediately, with zombies, corpses, obstacles and spawn points placed according to the illustrations on the cards. The lab and exit set-up cards are not revealed; they remain face-down until a player accesses those sections by opening the doors, at which point the card is revealed and board set accordingly. The lab requires a little extra pre-game prep. A number of antidote tokens (a particular type of Beaker Token) equal to player count must be combined with enough of the other Beaker Tokens to make a total of six (seven for a 5-player game). These are set next to the lab area face-down awaiting the reveal of the lab set-up card. The Zombie Deck, which determines the actions zombies take each turn, needs to be prepared. The rulebook comes with suggested Zombie Deck compositions depending on player count and desired difficulty. As a competitive game it will be difficult enough to beat your opponents… but you can make things harder on everybody by boosting the efficacy of the zombies through deck construction. The Main Deck (which probably should have been called the “Action Deck”) and Item Deck are both shuffled and placed near the board. Finally, each player selects a character and prepares their Character Sheet. There are no variable powers in Student Bodies, but each character receives one Item Card that serves to differentiate them. Each Character Sheet gets five Health Tokens and three Stamina Tokens (these count actions to be taken). On to the game! The goal of Student Bodies is to make your way from the entry of your High School to the Science Lab, navigating a hall full of your former classmates turned undead, in order to find the antidote to the zombie virus (alas, you’ve been bitten prior to game start and will eventually turn…) Once you’ve got an antidote in-hand you’ll head back through the hallway of the reanimated to make your way out of the school… and lock the doors behind you dooming anybody who doesn’t get there before you. Part racing game, part zombie-smasher, part “take that”, you’ll be using a lot of hand management and striking a balance between exploration, running and fighting as you go through each of four steps on your turn: Ready Items, Zombie Actions, Player Actions and Cleanup. During the Ready Items step, the active player may go through their inventory of items (which is theoretically unlimited… but you may need to shuffle discards back into the 23-card deck in a 5-player game to make this so) and select which 3 items they’ll have access to this turn (only one of these items may be labelled “weapon”). All un-readied items return to your “backpack” – the area to the left of your Character sheet. Student Bodies gets exciting during the Zombie Actions phase. The active player will draw the top card of the Zombie Deck, which will instruct the active player to move zombies, add zombies to the board, or both (as well as some other nasty effects on the higher-level zombie cards). But the active player has a surprising amount of say as to how the zombies go about their business. You’re only handicapped by one rule in zombie movement: zombies must move toward the closest character. As you might imagine with a board this narrow, there are frequently multiple “closest characters” (even in 2-player games!) Where there are options the active player gets to choose which of these “closest characters” to advance the zombie on. In some instances you can even open a clear path for yourself through zombie movement, then exploit that path during your player actions. And in the event of a zombie attack (which triggers when a zombie with a movement point to spend is already adjacent to a character) with multiple possible targets, the active player gets to choose the attack’s recipient. The Player Action phase allows you to expend your Stamina Tokens moving or playing Main Deck cards from your hands. Some Item cards require Stamina Tokens to play; others are used for free or discarded for use. In general players have three Stamina Tokens to expend, but this amount can be raised by use of certain cards. Movement costs 1 Stamina Token, as does standing up if you were knocked down by a zombie or opposing player. The final phase – Cleanup – allows players to discard any unused Main Deck cards from their hand (if they choose) and re-draw to a hand of five. At this time Stamina is reset to three tokens. Student Bodies has two great tools for keeping players dialed-in when it’s not their turn: first, zombies can attack you constantly (and other players may choose to as well) – it’s not uncommon in a 4-player game to suffer two or three attacks between your turns; second, your hand of Main Deck cards (and possibly some Items) will contain abilities you can use during other players’ turns to combat these attacks, in some cases even attacking back. While a 4-player game will take longer than a 2-player game, there is never a dull moment… even if you’re waiting 10 minutes for your next set of Actions. When attacked by zombies you’ll roll the Zombie Attack Die. This 6-sided die has two “bite” faces (you’ll lose a health token unless you have a card to block it), two “knock down” faces (you’ll suffer no injury, but be prone to an automatic bite on the next attack and have to use one of your precious actions to stand up on your next turn) and two “miss” faces (zombies see poorly – they bit the trash can instead of you). While this even distribution can make the zombies a little less potent (given the abundance of cards that help you dodge bites, you’re more likely to get away clean on a zombie attack than take a wound), the sheer volume of attacks you’ll encounter keeps the damage coming. If you lose all of your Health Tokens before finding an antidote you are dead. Temporarily. For you will rise… and you will hunt your former schoolmates until the last has perished. Upon death you’ll flip your Character Sheet – the back contains your character’s Smart Zombie. You will swap out the normal character standee for its orange-rimmed zombie version and begin tormenting your former comrades. Note that losing your final Health Token AFTER finding the antidote will truly kill your character. You’ll be watching the rest of the game from the bleachers. While alive you were able to attack other players, but you were generally more concerned with finding the antidote yourself. Once dead such qualms are gone… no more exploration or running, just feeding! You keep three Stamina to expend on actions per turn, as well as a hand of five cards from the Main Deck that make you much more powerful than a regular zombie (some Main Deck cards contain extra powers for Smart Zombie use only). However, you can still be double-killed – Smart Zombies have only two Health Tokens (although there are means to generate more)… if you lose these you’re eliminated from the game. To win Student Bodies as a Smart Zombie you need to eliminate all living characters. All Smart Zombies still alive when the last living character dies have won. This is a big box holding a bunch of stuff. First and foremost are the cardboard standees. There are 18 Zombies (in eight unique illustrations), 5 Characters and 5 Smart Zombies. The illustrations are fantastic, the cardboard durable, and the scale huge (around 2.5 inches); these are probably nicer than miniatures would have been. While 18 zombies doesn’t sound like a lot, it’s just right for a board of this size. If all of them are out, you’re probably dinner. “A board of this size” may make it sound small, but it is actually quite big. It just doesn’t have an abundance of space (due to the large size of the standees). It’s more concerned with setting the grid for the game than setting the theme, so school-related touches are minimal (lockers adorn the sides, as well as a few classroom doors… and a few blood smears in the corners). The Main Deck contains 82 cards of possible actions in 22 flavors (between 2 and 6 cards apiece). If this seems like a small number of unique actions for 82 cards, it’s made up for by the Item Deck. There are 21 unique items among that 23-card deck. The value of these cards can vary – they’re all useful in certain situations… but the situations for certain cards materialize more frequently than others. Of the 126 included cardboard tokens, I only have complaint with the Stamina Tokens. It’s not a quality issue – all cardboard in Student Bodies is above average – but a size issue. They’re the smallest tokens, but the ones you handle most frequently. The rulebook itself offers a solution – simply use one Stamina Token to slide up and down your Character Sheet as you use Stamina, rather than moving three-plus tokens back and forth each turn. It’s a small recommendation, but helps de-clutter a component-heavy game. Five included Character Sheets do a nice job of providing a breakdown of rounds and actions as well as tidy homes for your Heath, Stamina and Antidote tokens. They also work well to help separate the living from the undead. 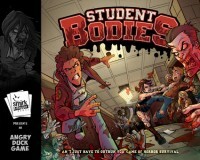 Student Bodies is easier to get the hang of than most zombie survival games. As many in the genre are cooperative, they inevitably end up pretty rules-heavy. Being competitive, Student Bodies can skip the convoluted rules on zombie spawning/movement, item trading (as is the modus operandi of Smirk & Dagger Games, you would never think about helping a fellow player in Student Bodies) or general pressure-building that ensnares its cooperative cousins. This allows you to get the hang of the zombies pretty quickly… but your opponents are just as dangerous, and frequently completely unpredictable. Like all good hand management games, truly mastering Student Bodies involves knowing when to utilize or dump the cards in your hand, and anticipating what remains in the deck to turn the game to your advantage. We learn through repetition. Even if the game were light enough for families – and it’s not, unless you love stabbing your children in the back – it’s a zombie game. Lots of violence and gore. This is more of an “unfortunate no” than a “maybe”… there’s so much action, laughing, jesting and celebrating that Student Bodies seems great for Social Gamers. But it’s more complicated than any party game, and would take a lot of time otherwise spent playing games just to teach the rules. The draw of the card introduces a lot of variability into Student Bodies, but you can cycle your entire hand if it doesn’t suit your plans. And while the game has only two overriding strategies – trip, bump and outright maul your opponents to find an antidote and escape first, or intentionally turn zombie and kill everybody – there are plenty of decision points along the way to give yourself an advantage in one or the other. Zombie anything is usually easy to get Casual Gamers into, so an easier-to-learn game in the genre should work. But it will be on the rules-heavy end of a Casual Gamer’s library. A racing/exploration/fighting zombie game? Are you really going to miss this one? Don’t be mislead by the “No Guns” badge Student Bodies proudly wears… while there are no guns, there is certainly a ton of violence. Your vessels may be soccer trophies and hockey sticks rather than bullets… but you’ll be smashing skulls all the same. While this was a little surprising (we were anticipating more of a “run at all costs… but trip others while you’re running” game), Student Bodies is not worse for it. It’s a lot of thematic fun stuffing your backpack with items you find in the corpse-strewn hallway that may be of use later. The fact that it’s all stuff a high school student might carry rather than guns and knives just makes sense. Like most zombie games Student Bodies plays with the fear of “what’s behind that door?” And while it does so less frequently (due to only 2 rooms to open), it enhances the unknown by not telling you until you open the door how close zombies may actually be to you, and what exact point in the room you need to arrive at to accomplish your objective. Scaling for player count is rather unique Student Bodies. 2-player games play nothing like 4-player games, but they’re equally challenging. In a 2-player game you’re at little risk from opponents but you WILL be overrun by zombies. It can be imperative to be well equipped with items before entering the Lab and finding an antidote. In a 4-player game more zombies will die… but those opponents will do some nasty things to you. And you will return the favor. There are no guns, no chainsaws; it's a high school, requiring you to be more resourceful. Players may even go most of the game without a weapon at all, hoping to dodge their way through. But take heed because players who die before taking an antidote join the game to feast on the living. Unlike the mindless horde, they rise as extremely deadly "smart zombies", still playing with their full hand and hunting the living players. It's even possible for zombie players to win cooperatively by killing everyone else. Student Bodies creates an intense feeling of desperation and maintains it throughout, while the humor comes from the horrible lengths players will go to survive at the expense of the others. Randomized board elements and a customizable zombie AI deck keep the game fresh and allow its difficulty to be raised or lowered to a significant degree. When you think of high school, do thoughts of bullies and ‘backbiting’ come to mind? Do recollections of the old alma mater cause panic attacks or repressed feeling of failure and frustration? If so, then this game should be a walk down memory lane. It will let you relive the terrors of high school, but in a new light. Though you won’t be relegated to the back table of the cafeteria, you will get pushed around and picked on, but this time you can fight back. There is no group of jocks, eggheads, or popular students. Everyone is on their own and on equal terms. This is everyone for themselves. This is war. This is survival. Overview: In Student Bodies, you and your classmates have been bitten by the infected students at your school. Your only chance to leave the building the way you entered it is to get to the lab, find the antidote, and be the first to leave. You will, of course, lock the building on your way out. After all, those other students will eventually turn, and it won’t be for the better. Players navigate a hallway of hexagonal spaces that are littered with debris as zombies appear in the doorways. They will attack you, unless you can place your classmates in harm’s way. Don’t worry; they’ll do the same thing to you. Components: Players and zombies are good quality cardboard standees. The artwork is excellent and cartoonish. A single imprinted custom die will determine the outcome of attacks. The game board is large, sturdy and folds flat. There are 5 character boards that organize your items and monitor your health and stamina. There’s also a deck of fairly durable cards that you will be relying on to give you an advantage over the zombies and your newly bitten classmates. You are also given scenario cards to mix conditions up a bit, but the basic premise is still the same. Several thick cardboard tokens represent obstacles, items, and beaker tokens. Gameplay: Each player is assigned a character card which will keep track of stamina (actions), health, and possessions. Each player also draws an item to start the game. Items can be weapons with limited uses, armor or abilities. The game is set up with a selected scenario and predetermined difficulty level. Players start at the end of the hall and must navigate obstacles and zombies to get to the science lab. Each turn a player will spawn and move zombies, take their own actions, and replenish their hand of cards. Zombies must move toward the closest player, but in the case of a tie, the play can make a classmate seem more nutritious. Zombies can knock another player down or bite them. Actions by the player’s character include standing up, moving or attacking. A player also has a hand of 5 cards that can be used to aid in the destruction of zombies and other players. At the end of the turn, a player can discard any cards they want and replenish the hand to the full 5 cards. The goal is to get to the lab, find the antidote, and get back out. As zombies are defeated, item markers will arise; but be careful as not all item markers are good. Beaker tokens in the lab can provide the antidote needed for your escape, but not every beaker contains what you’re looking for. Once you have the antidote in hand, high tail it to the exit. Don’t expect an easy escape. Impressions: In keeping with Smirk and Dagger games, much of this game rests on sacrificing your opponents to pave the way for your success. Expect retaliation. Turn order doesn’t seem to matter. There is a component of luck in the game when it comes to drawing action cards and searching for items and beakers, as well as the roll of the die which determines attack results by characters and zombies. As with most zombie games, once you find the antidote and you’re ready to escape, the school is overrun by zombie students. A slashfest ensues in which only the most daring and fortunate will survive. Defeat can come early in the game if you are not careful, but once a player’s health is gone, they can become smart zombies, and still win the game by being the last player standing. Unfortunately, if you have already found the antidote, you are no longer capable of becoming a zombie and the game ends for you. Being patient and holding the right cards to the end of the game can be the difference between a secondary education or being the second course entre of the zombie horde. Final Thoughts If you have other zombie games, save your money and get a game of a different genre. The components are well made but an overly aggressive player could disrupt the game board. The artwork is excellent and captions quite amusing. Even without a victory, some battles can be extremely satisfying. If you missed your last class reunion, this game might be the next best thing to being there. In the picture shows, unless you are ‘Zombie with One Eye’ or ‘Candy Striper Zombie’ and the camera lingers on you for a minute, when the credits roll you are going to join that scrolling name horde filed under Z: friends, neighbors, and idle production assistants. The same is true in the Cardboard Kingdom since the Cult of the Zomb took up residence. There’s plenty of Zompocalypse in a box out there and unless you bring something new to the table – you’re just another grey face in the crowd. There are a couple of Capital Z’s out there that strut their shamble away from the horde, but where does Student Bodies lurch? Confined Space: You don’t really see this much from the Cult of the Cardboard Zomb. Zombicide – well The Boy has two boxes full of ten poundage worth of city. Last Night on Earth gives us a slice of Main Street USA and I could probably tile my kitchen by the time I hit expansion 7 of Twilight Creations’ original plague starter: Zombies!!!. There’s plenty more to worry about than The Zomb in not-zombie zombiefest, Dead of Winter. Tower Defense Zombie Panic and shamble drop box Run,Fight,or Die are about staving off the mouths-to-not-feed. Remember how crowded that walk to Trig class was down Math Hall? Now throw some brain munchers in there. Student Bodies drops you in a box. A box filled with zombies. You need to race through that box, into a smaller box, back through a now more maw crowded box, and squeeze through a smaller box in hopes of hitting an exit before hitting zero life. There’s no urban sprawl; there’s final moments racing through tightening spaces. There’s no locking the cabin door to buy yourself a turn or two; there’s out in the not-so open. There’s no throwing a glass bottle so uncredited Zombie #3 shuffles away down the alley; there’s tripping your lab partner into the undead dogpile and turning tail to bob and weave three spaces to a very temporary safety. While I can probably sunbathe on the massive board – it’s big hexes and little room. This is when Shaun of the Dead flips and gets ugly. The romantic nightspot/impenetrable fortress is no longer a slice of fried gold. You are in the worst possible place for when the horde starts massing: a confined space. Some Weapons.No Guns: There are no shotgun shell bandoliered survivalists in Home Ec. Quite a few Zombs start you out running on empty though, so that’s nothing new under the corpse raising comet. You often find yourself looting for baseball bats and 2×4’s with the convenient sticky-outy nail and the all important card text: FIREARM. Student Bodies has none. No headshots. No long range day savers. No decent way to thin the pack. Your means of survival are field hockey sticks, janitor mops, and a rather handy inhaler. Most ‘weapons’ work on adjacent enemies with a rare two range (and an even rarer one-shot ZombieBowl effect). That zombie three spaces away and closing is always a threat because he’s coming for you – and he’ll get there. Your bitey former classmates are very up close and personal and there’s little you can do about it until they are inevitably ‘braaaaaaiiiiiiinnnnssss’-ing down your neck. Push comes to shove you’ll be doing quite a bit of pushing and shoving, knocking biters back and to the ground and hoping to ‘unclose’ the gap before they bounce back. You always feel threatened and you always try to stay one step ahead and maybe, just maybe, you’ll have that varsity jacket to throw around your head when that guy you were hoping would go to prom goes ‘nom’ instead. Now excuse me while I sucker punch you and run for the exit. Uncooperative:We’ve come to the true horde splitter. Most Zomb is Us vs. Them in some way, shape, or shambling form. While shooting your buddy first when space clearing in Zombicide isn’t particularly handy, you are still racing about together to make sure the blue key gets to the blue door and exit zone heaven. Dead of Winter plays it grey with Us (..well, most of us – maybe not that guy, but I’m not exactly sure) vs. Them. Last Night on Earth splits players into Us Vs. Them Hero and Zombie teams. Student Bodies is strict selfish play,dirty tricks, and Me vs. You vs. Them. There’s no room in the Boxalypse for holding hands, singing Kumbaya, and bashing undead braincases in the name of togetherness. You were cute in homeroom this morning; now you’re in my way and not my problem. Gameplay is a pull/push mechanic. Pulling ahead through any holes in the horde you make while pushing the walkers away from you and focusing them on your won’t-make-the-reunion fellow players is the state of play. Keep one step ahead and a few cards for the defensive because they’ll be doing the same to you. Pepper in some backstabbing and trip ups for when you don’t have to outrun the zombies, you just have to make sure your classmate doesn’t. [Spoiler Alert] Harken back to Season Two of The Walking Dead – you know – Doc’s Farmhouse. Remember when Al Capone from Night of the Museum II (Shane) kneecapped that guy with the lazy eye from Deadwood (Otis) into a late night snack in a high school parking lot because Carl (Carl) couldn’t stay in the house? Except you have a soccer trophy. And Otis is pondering kneecapping you as well. It’s tough to teach a reanimated corpse new tricks – but I wouldn’t call Student Bodies ‘samey gamey’. It’s a fun, but tense, exercise in tight spaces, smart card play, zombie herding, and dirty tricks. As Zombie Curriculum goes it may not be a Required Class, but it certainly is a fresh and interesting Elective Course. I fully admit, I love zombie horror games. Student Bodies takes a fresh new twist on the many classic, co-op, shoot-’em-up zombie games out there. You play as one of several high school students in a zombie-infested school. Here’s the catch: you’re already bitten! The clock is ticking for you to race across the hall to the science lab, find your antidote, and make your way back to the exit, shoving your fellow classmates aside (and hopefully into a zombie!) along the way. The winner makes it to the exit first, locks the door behind him or her, and gleefully skips away with his life while the other students get eaten alive. Here are several aspects I love about this game: it’s different every time. The main hall, science lab, and exit each have a set of setup cards used to determine where zombies, corpses, and obstacles will be placed once you enter that room (can’t plan ahead!). It makes for a very fun variation each game. I also love the corpses strewn about the school. Turn them over to reveal nothing, to collect a valuable item, or get bitten by a sleeping zombie corpse! If you’re almost dead, I wouldn’t take the risk, but that’s just me. I also love the make-shift “weapons” which are much more realistic than other games. Remember, this one isn’t about killing hordes of zombies, it’s about escaping with your life. These weapons (that could be found in virtually any high school) include a lock and chain, a trophy, an aluminum bat, a bocce ball, and more. I also love the knock down aspect. Essentially, when a zombie attacks a player, the zombie either misses, bites the player, or knocks him down. If the player is knocked down, the next time a zombie attacks, no dice is rolled, the player is automatically bitten. The variety of action cards is also very impressive. There are normal action cards to be played on your turn, fast action cards to be played at any time, and reaction cards to be played when the trigger event occurs (usually when something happens against you). There are many fun, real-world scenario actions (like a duck and roll reaction card or a get up fast action). This game was a thrilling mayhem. While I love hard-core strategy games, I also love the chaotic bloodbath that you find in Student Bodies where players rely mostly on luck to win. It allows for a lighter, more reactive game which can be every bit as fun as the more strategy-heavy games. I’d also note that the artwork, while very impressive, is a bit gory for younger players or for the “faint of heart.” Overall, I give this a solid 7 out of 10. Zombiees are all over the place every day! RUN! Here come zombies! When I go to the store with games I see the zombies on the shelf and point and tell my friend to run because the zombies are there! rUN! Haha! Thwre are many zombie games. Looking at the pictures of this game I like to look because it looks like Scobby Doo! RU N! Scoby the zombies get your brains. this game makes me want to eat a Scoooby Food Snack! I think this looks good ! Add a Review for "Student Bodies"